If you’re a fan of slick skating, skillful puck movement and defencemen under 6 feet tall than the 2018 NHL draft is definitely for you. There are a handful of ‘small’ 2018 eligible defenders that have already started to open eyes this year and it’s only the second week of August. So far this summer, we’ve seen more than a few of the high-end 2018 draft prospects dazzle in international tournaments. Whether it be at the Ivan Hlinka Memorial or the World Junior Summer Showcase, there is little doubt that scouts are getting excited by what they’re seeing. With the way the NHL game has changed and the way NHL executives are expanding their minds, the label ‘undersized defenseman’ isn’t the death knell it once was. That said, we’d be kidding ourselves if we tried to pretend there wasn’t still a size bias in scouting. This year, however, we are going to see a number of players drafted very high in the first round that don’t come close to fitting the mold of the defenseman old ‘hockey men’ are used to. I’ll admit, I had my doubts about Quinn Hughes as recently as a month ago. He has a ton of talent, and despite a pretty good season with the USNTDP last year, his size was a legitimate concern for me. That’s all gone now. Hughes looked great for the US at the World Junior Summer Showcase and has played his way into strong consideration for the WJ team come December. Hughes is an incredible offensive defenseman. He’s one of the best skaters in the draft and has the hands and mind to keep up with his feet. He’s a smooth player that can create offense off the rush and has the vision to be an elite playmaker at any level. His lack of size does hurt him in the defensive zone, but he reads and reacts to the play very well and has a very high hockey IQ that always allows him to be in the right position. He’ll spend this season at Michigan proving that he belongs in the conversation to be a top-5 pick next June. The younger brother of Devils 2017 second round pick, Boqvist is a very young, very skilled right-handed defenseman that should find himself drafted in the top-20 of the draft. Boqvist is the definition of a puck moving defender, whether it be with the puck on his stick or using his tremendous passing ability. He won’t turn 17 until next week, but Boqvist is already putting on a show at the Ivan Hlinka MeMorial Tournament. With 6 assists in his first three games for Sweden, he’s showing why scouts are excited about his offensive talent. As good as his physical tools are, the biggest strength to Boqvist’s game is likely between his ears. He anticipates the play incredibly well and is able to be one or two steps ahead of the opposition. Again, size and strength are an issue, but he’s one of the younger players in the draft so there is a lot of time for him to mature physically. The first overall pick in the 2016 OHL Priority Selection Draft, Merkley is the kind of exceptional talent that has the ability to lead a junior team right away. 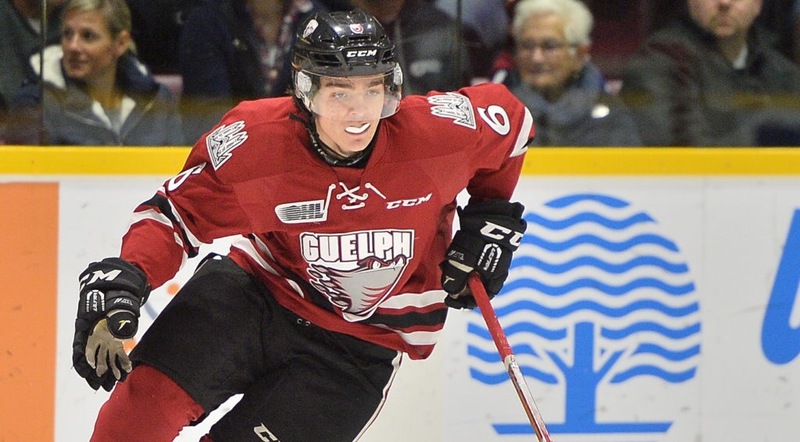 As a 16-year old, Merkley led his Guelph Storm in scoring (55 points in 62 games) and he was among the most productive defensemen in the entire OHL. Merkley is a wizard with the puck. He skates well, thinks the game at an advanced rate and has already proven he can run a top powerplay unit. As one OHL observer told me at the end of last season “Merkley is going to be an absolute superstar – if he ever learns where the defensive zone is”. That’s a bit harsh as Merkley improved his defensive play through the season, though it’s still got a long way to go. He has to work on his positioning, and he’s very obviously thinking offense first every time he steps on the ice. Defensive improvement will come. Like Boqvist, Merkley is born in mid-August so he is nearly a year younger than some of his draft peers. He is already an elite possession driver and if he can show all-around growth to his game, there’s no reason Merkley shouldn’t be selected in the top-10 next summer. Like Merkley, Ty Smith was drafted first overall in his junior draft. Playing for the Spokane Chiefs, Smith finished third in WHL rookie scoring with 32 points. Smith is probably closer to being a complete defender than the others on this list. He can close space on opponents quickly and has a good sense of when to risk his position for the sake of offense, and when he should hang back to defend – a skill that you love to see in a 17-year old. This season, Smith is likely to get a lot of powerplay time and scouts will be watching for his offensive numbers to take a jump this season. He has the ability to be one of the highest scoring defenders in the WHL and it will be important to see if he reaches that potential without sacrificing his defensive play. Right now, Smith looks to be a mid-first round pick and continued growth this season will help solidify him as a lottery pick. The 2nd pick behind Smith in 2015, Addison likely ended his rookie season in Lethbridge being viewed as a second round pick. That has likely changed as the right-handed defenseman has shown a lot of growth this summer while being absolutely dominant at the Ivan Hlinka. With 2 goals and 5 points through three games, Addison has been Canada’s best player at times – outplaying both Smith and Merkely for large stretches of the tournament. Like the others on the list, Addison is already proving to be a valuable asset on the powerplay. He can be the facilitator, but he also knows when to jump up into the slot and he’s got a wrist shot that allows him to capitalize on the scoring chances. He’s smart and has good positioning, but like any 16-year old playing in a league against 20-year olds, Addison was exposed when needing to use his strength to win battles down low and in front of the net. If he can carry the momentum from this summer into the WHL season, Addison will find himself selected in the top-31 of next year’s draft. *Honourable Mention to Jett Woo, who was ineligible for this list because he is listed a 6-feet tall – though he probably isn’t. Not seeing how any of these defenders are “undersized”. Woo, Smith and Addison are smart, strong, and good skaters and if they keep playing forward, not scared and defensive, they’ll be great defensemen.